The limiter-edge experiment focuses on properties and generation of intermittent, or bursty, turbulence structures. As with the temperature filament experiment of this thesis, the turbulence study is motivated by the relevance to transport. Intermittent turbulence is one cause of particle transport in tokamaks [D’Ippolito et al., 2002]. The LAPD-U study conducted by Carter allows for an in-depth statistical study of these bursty events, showing that intermittent structures, or “blobs”, are detached and radially propagating objects with a dipole potential profile [Carter, 2006]. Figure 5.1 illustrates the geometry of the limiter-edge experiment. An electrically floating aluminum plate is installed on a hinge inside the LAPD-U. Partially closing this plate causes a blockage of primary electrons that are emitted from the cathode during the main plasma phase of a discharge. A strong density gradient results from the blocking, which is shown in Fig. 5.2. Figure 5.1: Schematic of the setup for the limiter-edge experiment in the LAPD-U. An electrically floating aluminum plate is used to partially block the emission electrons during the main plasma phase. A large density gradient is set up and intermittent structures are observed behind the plate. 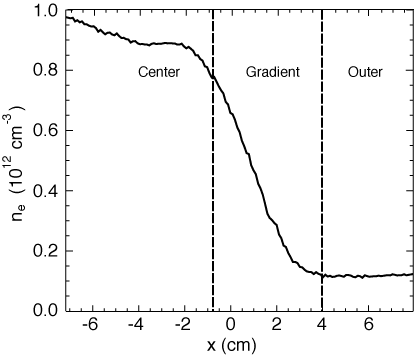 The density profile shown in Fig. 5.2 is labeled to highlight the similarity between it and the temperature profile of the temperature filament experiment. Three regions are defined in Fig. 5.2: Center, Gradient, and Outer. The Center region is the main plasma column, which features a fairly flat density profile in which the only aberrations are due to asymmetries in the emitting cathode itself. Negative polarity pulses (see Fig. 5.5) are observed in this region. The Gradient region occurs across the radial boundary of the blocking plate. A unique feature within this region is the observation of both negative and positive polarity pulses. The small radial dimension of the temperature filament experiment prevents a definitive measurement of negative and positive pulses in the same region. Finally, the Outer region is behind the plate. Positive polarity pulses, often of very large relative amplitude ( ~Isat / Isat > 100%), are observed in this region, as shown in Fig. 5.6. Figure 5.2: Plasma density profile from the limiter-edge experiment. Three distinct regions of behavior analogous to those found in the temperature filament experiment are labeled. The limiter-edge experiment exhibits exponential power spectra for Isat measurements in all three regions indicated in Fig. 5.2. An aspect of this experiment is that the turbulence is always fully formed, i.e., there is never a classical transport regime and therefore no transition from classical behavior to broadband turbulence. For this reason, the time series always demonstrate pulse behavior as shown in Fig. 5.3. The gradient panel is a mixture of positive and negative polarity pulses. Figure 5.3: Raw Isat traces from each of the limiter-edge regions shows the bursty nature of the pulses. This figure is an adapted form of that appearing in Carter, . The measurements from all three regions exhibit exponential power spectra, as shown in Fig. 5.4. Fits to the exponential behavior of the spectra in this experiment yield a value of τ = 7.0 μs, which compares well to the value of τ = 7.2 μs obtained by measuring the characteristic widths of individual pulses. A model of Lorentzian pulses featuring characteristics consistent with those measured in the experiment also produces a power spectrum with equivalent exponential behavior. Figure 5.4: Power spectra from Isat measurements in the limiter-edge experiment. The spectra are observed to be exponential from each region of the density profile. The example pulses of Figs. 5.5 and 5.6 are immediately comparable to Figs. 4.11 and 4.10 from the temperature filament experiment. The pulses themselves are more similar between these experiments than any other parameters. The negative polarity pulses from the limiter-edge are observed at amplitudes much larger than the background fluctuations. 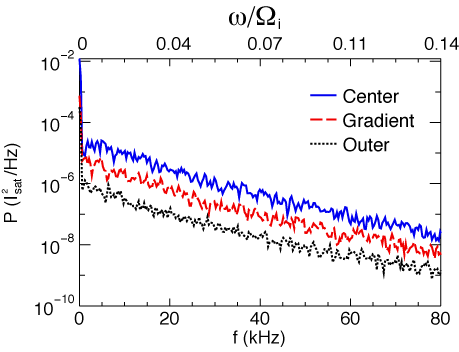 Figure 5.5: Isatmeasurements from the center region of the limiter-edge experiment. (a) A wide view of a single, negative polarity pulse (solid black) with an overlay of a low-pass filtered signal (solid red). (b) The filtered signal (solid red) is fit with a pure Lorentzian function (dashed black). Figure 5.6: Isatmeasurements from the outer region of the limiter-edge experiment. (a) A wide view of a single, positive polarity pulse (solid black) with an overlay of a low-pass filtered signal (solid red). (b) The filtered signal (solid red) is fit with a pure Lorentzian function (dashed black). Additional work has been performed with regard to the presence of asymmetric pulses. A particular example from the limiter-edge experiment is presented here. The exhibits a steepened leading edge with a more slowly decaying following edge. This feature is similar to observations that have been made in “blob” studies [Antar et al., 2003; Boedo et al., 2001]. Blob phenomena [Zweben, 1985] are an ongoing area of fusion research focusing on the origination and control of intermittent bursts that are seen in the scrape-off layer and far edge of tokamaks. Figure 5.7 illustrates that a very close fit to the measured asymmetric pulse can be obtained using a product fitting function of the form f(t)L(t). The asymmetry of the pulse shape introduced by a function of the type given in Eq. (5.1) has very little effect on the power spectrum, as illustrated in Fig. 5.8 which shows a comparison between the power spectrum of the product fitting function, fL, the power spectrum of the basic Lorentzian, L, and the power spectrum of the individual pulse. The power spectrum of the Lorentzian (solid black line in Fig. 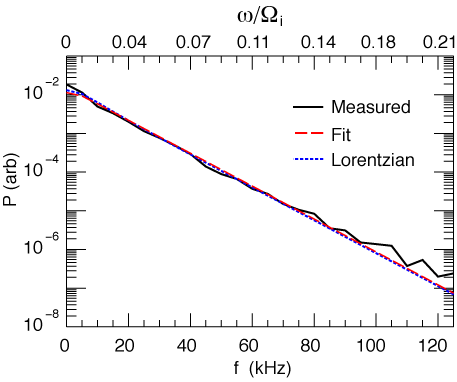 5.8) and the skewed Lorentzian (dashed red line labeled “fit”) are almost indistinguishable and both represent the power spectrum of the individual pulse very well, but for a slight deviation at higher frequencies. The exponential nature is retained over a broad frequency range. This example shows in detail that the asymmetry of pulses observed in the data does not destroy the exponential nature of the power spectrum. Figure 5.7: Solid black curve is a measured pulse previously shown in bottom right panel of Fig. 5.5b. Dashed red curve is functional fit consisting of a Lorentzian multiplied by a distortion given by Eq. (5.1). While the particular example given here shows no discernable difference between the power spectrum of the basic Lorentzian fit and the product fitting function, the general case is that the power spectra of the two fits will differ. The differences are found to be small and occur at low frequencies (below 20 kHz). In general, observed asymmetries in individual pulse shape do not alter the exponential nature of the power spectrum. 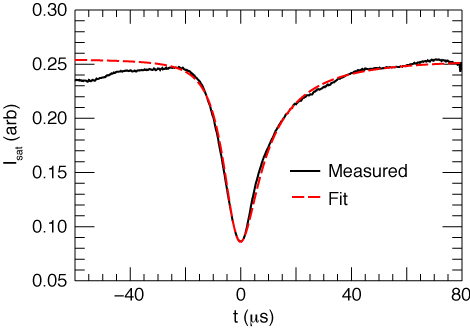 Figure 5.8: Power spectra of the measured pulse (solid black) compared to that of the fit (dashed red) and of the fundamental Lorentzian pulse (dotted blue). The normalized frequency scale corresponds to the limiter-edge experiment in which the pulse is observed. The similar time series and spectral results from the temperature filament and limiter-edge experiments supports the concept of exponential spectra as a universal feature of plasma turbulence. The limiter-edge experiment further supports the universal aspect of the pulses and exponential because of its relationship to intermittent transport in tokamaks. The limiter-edge may be described as a series of filamentary structures. This view applies to the scrape-off layer or outer region of toroidal plasma as well. Similarities between the limiter-edge and temperature filament experiments indicate that the single filament environment produces behaviors that are observed in the even more turbulent environments observed in other plasmas.